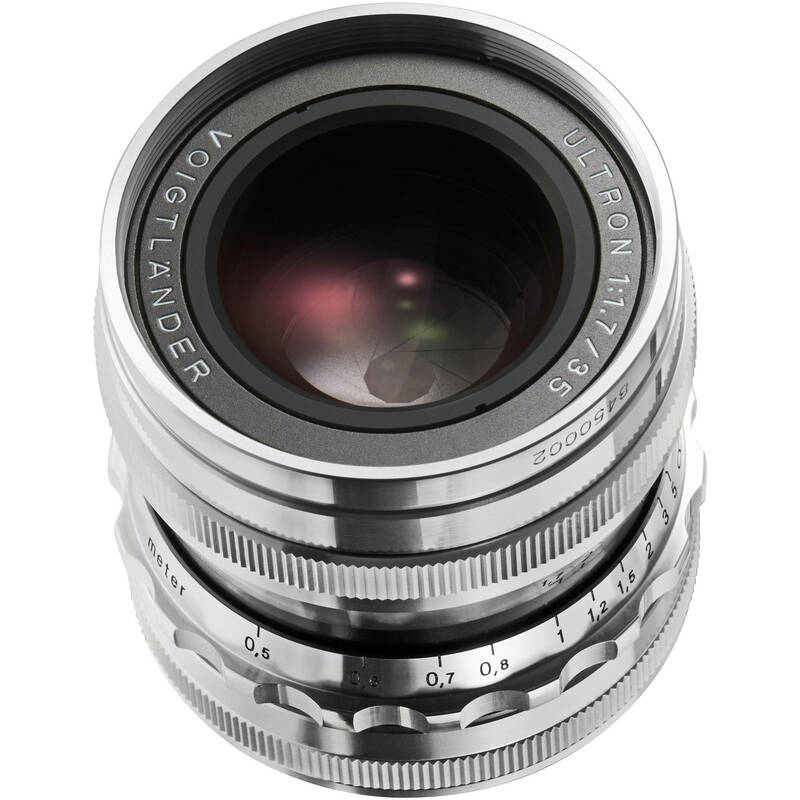 A favored focal length among street photographers and journalists, the silver Ultron 35mm f/1.7 Aspherical Lens from Voigtlander is a standard wide-angle prime designed for use with M-mount rangefinder cameras. The versatile focal length is complemented by the fast f/1.7 maximum aperture, which benefits working in a variety of lighting conditions and also offers enhanced selective focus control. The lens construction incorporates a single aspherical element to reduce spherical aberrations and distortions for increased sharpness and clarity, and the ten-blade diaphragm helps to achieve a smooth, pleasing bokeh. This manual focus lens permits focusing as closely as 1.6' away and depth of field and distance scales aid in pre-focusing and zone focusing techniques. Fast f/1.7 maximum aperture benefits working in low-light conditions and also enables greater control over focus position for selective focus applications. One aspherical element is incorporated at the rear of the nine elements in seven groups construction, and helps to limit spherical aberrations and distortions. Manual focus design enables a minimum focusing distance of 1.6', and it is rangefinder coupled for accurate focusing to 2.3'. Ten-blade diaphragm contributes to a pleasing out-of-focus quality when working with shallow depth of field techniques. As part of Voigtlander's Vintage Line of lenses, this lens features a silver-colored brass finish to give it a classic appeal that is well-matched to classic rangefinder camera designs. Compatible with optional LH-9S lens hood. Box Dimensions (LxWxH) 7.9 x 4.6 x 4.5"
Ultron 35mm f/1.7 Aspherical Lens (Silver) is rated 4.8 out of 5 by 6. Rated 5 out of 5 by Rolf from Fantastic again A wonderful lens. Focus ring with its retro design a little hard on the fingers, but on the other hand, easy to identify for video work. This lens on a A7S II is just as great as the 40mm Heliar 2.8. I have only recently discovered the Voigtlaender - E-mount connection as well as the incredible video capability of the Alphas. The Voigtlaenders are a fantastic choice for manual focus / iris operating mode. It is really sharp with negligible CA, distortion and vignetting for 4K Video work. So far I have 3 Voigtlaenders and all are better than the Zeiss Superspeeds or all other various Cine lenses I own. Rated 5 out of 5 by Henry from Consistent detail at all f stops This is a delightfully small lens. I find the way it draws to be most attractive. In addition I did a bit of pixel-peeping and found it very sharp with very small drop off to the edges. My sample has the most consistent resolution at all f stops of any lens I have examined. Rated 5 out of 5 by Albert from Fantastic Optics with User-Friendly Ergonomics I purchased this lens because my own 35mm Leica is incompatible with the Fujifilm M-adapter on my X-Pro 2 camera, it received an excellent rating in Reid Reviews (besting optically the Leica Aspherical Summicron) and was on sale. It is 1/2 inch longer and hunkier in hand than my Summicron. I tested sharpness and distortion against a brick wall and newsprint and took outdoor images as well. Pros 1. Fully open, it is sharp as a tack in center and acceptably so at the edges (which become very sharp at f/3.5), there is no corner luminance vignetting, no distortion or chromatic aberration. 2. Color saturation is rich and contrast strong. 3. There is no focus shift, an advantage when focusing at full aperture and then stopping down.. 4. Longer length permits greater separation of aperture ring (deep, discrete stops) and larger narrow focusing ring with prominent ridges (provides immediate tactile recognition) that helps prevent inadvertent aperture changes while focusing. Con: Instead of being a raised red dot, as on most other lenses, the mounting index is a short, thin red line etched on the metal mount (hard to see, especially in dim light) making quick mounting of the lens a hassle. An adequate unvented hood with a plush push-on end cap comes standard (no mention of it in the description), and I see no need for the accessory vented model unless you have a true rangefinder camera and would benefit from the vent. Besides, you would then be compelled to use the small plastic pinch type lens cap, and that's not nearly as convenient as the push-on cap. I gave it 5 stars, chiefly for its outstanding optics, but also because it just feels good in my hand. It is sharper than my own Leica and almost certainly the CV f/1.4 and Nokton stopped down to its f/1.7 aperture. It has earned a spot in my small travel bag containing other Leica lenses and I'm sure it will be the one mounted to my camera 90% of the time. It's that good. Rated 5 out of 5 by Wonil from Small, light, sharp Small, light, and sharp. What more do you want? Used it on a Sony body with an adapter - perfect for street photography. Sharp at max aperture as well. Rated 5 out of 5 by Brian from Really sharp,great isolation Much like the experience with Voigtlander 40/1.2. Its very sharp,small & focus is easy with Sony. Heavy CA wide open but fixable. I find manual lenses are sharper so its a fun walkaround lens. Not for anything moving though,why go thru that pain:) Just grab an AF lens for that. Rated 4 out of 5 by Gary M. from Much better than expected I bought this small, lightweight CV lens to use on my Leica SL. I forever thought of myself as a 50mm kind-of-guy, but when I bought my SL I opted not to buy the very heavy 24-90 zoom. Instead I used the little 23mm Leica T lens (this lens is very light, takes very good images and with SL firmware 2.0, focus is lightning fast). On the SL, this lens provides an effective focal length of 35mm. I would have kept to this T lens except for the fact that the SL drops down to only 10MP with this lens attached. I don't know why because on the T using this lens you get the full 16MP of the T sensor. Having found religion in the 35mm focal range, I wanted this focal length for my SL going forward (but without excessive weight). I've used CV lenses before on my Leica M9 and M240 so giving this lens a try seemed like a good idea. It was Wide open the center part of the image is very sharp and crisp. The out of focus areas are a bit busy so I would not shoot this wide open unless your background is rather plain and monochromatic (such as a bright blue sky or a wall). Against trees, etc., the effect is not so great. But stopped down to f5.6 or f6.8 this lens is terrific. Sharp across the entire image. Detail is very good. Contrast is good, but not on par with the equivalent Leica lens. But at 1/5 the price of a similar Leica lens, this lens is a winner. I would have given this lens 5-stars but I reduced the rating by one star due to the busyness of the out of focus background and the less-than ideal focus ring. Some retro designs should stay in the past this focus ring is one of those. I have a m6 classic color way, does this match the camera? Or would the black look better? Does a hood come with the lens?